Dating from the Art Deco period, a French applique embellishment dress or millinery hat trim. Bold colors, against a dark background, gives this elongated trim a dramatic flare. Padded embroidery satin stitch, plenty of metallic thread and cut out open work gives even more distinction. 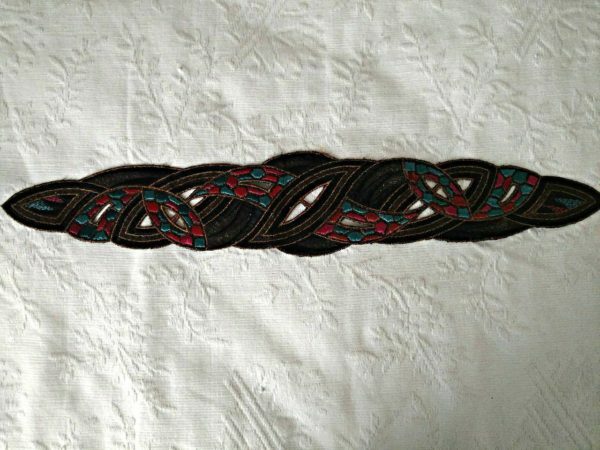 Beautiful for a head band, hat band or to dazzle a 1920’s Flapper dress. Maybe even making your own rendition.